On Saturday 19th May at 6pm, the bells of Chichester rang out to celebrate the wedding of the new Duke and Duchess of Sussex, Harry and Meghan. Who are the ringers and what do we know about the Bell Tower? The ringers are members of the Cathedral Guild of Bellringers, of whom there are three officers. The Master of the Tower, who is responsible for the affairs and discipline of the ringers; the Ringing Master, who is responsible for the technical aspects and training new ringers; The Steeple Keeper, who is responsible for the maintenance of the bells and the condition of the tower. 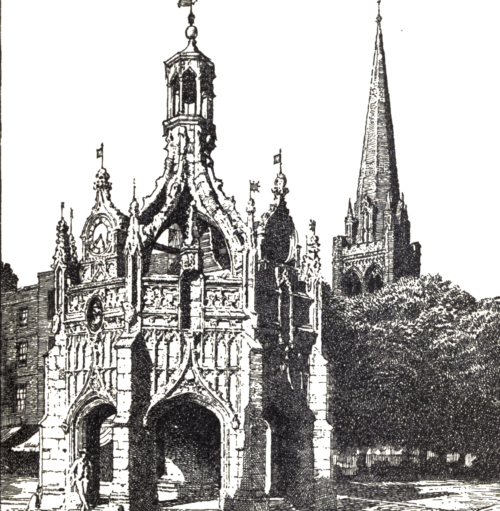 Until 1974 when a detached campanile was built at Chester Cathedral, Chichester was unique among English cathedrals in having a detached bell tower. 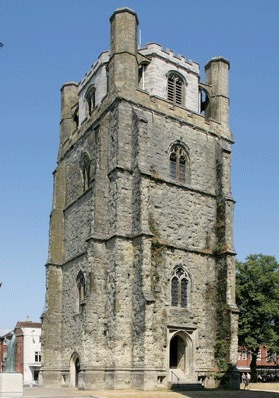 The present tower was begun in the latter years of the 14th century. It is just under 33 m (105ft) high and the walls are 2.5m thick (8ft). It is built of Ventnor stone which is not particularly hard and the ravages of the salt-laden, westerly winds have taken their toll. Bells were once hung in the central tower of the cathedral, but in the 14th century they considered it unsafe to ring them there. One bell still hangs there. Miraculously it escaped damage when the spire fell into the building in 1861 and it is now sometimes used as a service bell. There are 8 ringing bells, of which two date back to the 16th century. When the internal electric clock is working (! ), these two plus two more can be heard chiming the quarter and the half hours. On the hour, a ninth bell is struck and this is known as Great Walter. From 1878 to 1956 the clock was maintained and wound daily by a member of the Whitehead family. These days the clock is wound electronically and the chimes are automatically switched off by night.